Every business needs a website that brings in new customers. Our customers want a professional website that does this without paying the high prices on today's market. Your website should bring you more business! We make websites that work. If you or someone you know either needs a new website or is unhappy with their current website support. We can help! A website will give your business “Credibility." In order to be recognized as a legitimate business today you need a website. We don’t make cookie cutter websites. Each website is specific to our customer’s needs. We are genuinely interested in our customer. We ask each person what they want and give them exactly that. We get a complete understanding of our customer’s business. We identify our customer’s target -audience and create a website that communicates to that specific audience. We are both writers, eloquent and articulate. Our customers have full control over their website when we are done. It’s theirs. They own it. Our Websites are created with the Internet “3-point Approach” to getting more business. 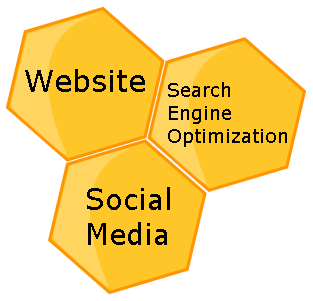 The three points are, 1) A website that works for you, 2) SEO, and 3) Social Media. We incorporate these three points into every website we make. We help you to understand why you need this, how this works, and what you need to do. Second Point: Search Engine Optimization (SEO), This is what helps more people find your business on the Internet. Did you know that Blogging is a critical part of successful SEO? Third Point: Social Media (Facebook, Pinterest, LinkedIn, Twitter, etc.) Many people don’t realize what an asset Social Media is to their business. It gives people a way to interact, it’s more personal. Social Media also works with your Website and SEO to give you more of an Internet Presence. More Internet Presence will bring you more business. There is actually a Fourth Point. This point is VERY important. This includes newsletters, emails, business cards, flyers, bulk mail promotions, posters, signs, banners, etc. These things "feed" people towards your website. If you have any questions you can call us email us or go to our Contact Us page and fill out the Contact form. We can help you make your own website. We use Weebly as we feel that is the EASIEST and BEST website-building platform out there for anyone building their own website. There are many templates to choose from and they are easy to upgrade. The customer service is phenomenal. One of our staff will walk you through the site builder step-by-step. They will teach you how to build your own site and answer any questions you have as the site is constructed. Then we leave you to do your "homework." Feel free to contact us with any questions that may come up while you are building your site. We can make you a new website in a short amount of time. If you have a lot of content, many hidden pages or e-commerce pages, it can take longer, but we are pretty fast with those as well. Review the "Quote" checklist and fill it out, or fill out the "Contact Us" form so we can schedule a consultation with you over the phone. We can maintain your website or teach you how to do it. We handle change and update requests quickly, always trying for the same day. With Safety Orange you still own your site! We are able to deliver a high-quality, professional product that many individuals, families, small companies and groups need and want at a reasonable and affordable price. Our finished websites are professional and appealing which makes you or your company look professional and appealing. You want more business. We want you to get more business! We can help lead you through the confusion of the web-building world quickly and easily. We hope you choose Safety Orange Websites for all your website needs. You can have a professional and beautiful website that works for you! Please contact us if you, anyone you know or if you happen to come across someone in need of a website or better website customer service. We want you to be happy with your website, 24/7.